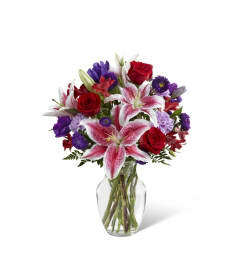 FTD® Friends Bouquet showers your favorite friend with love and affection offering them a gorgeous gift of flowers and beauty! Unforgettable lavender roses, purple carnations, hot pink gerbera daisies, green button poms and lush greens are brought together to create a simply stunning flower arrangement. 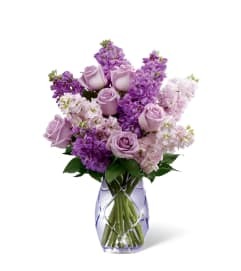 Presented in a designer purple glass vase with a silver metallic decorative tag stating, "Friends", dangling from the neck, this mixed flower bouquet will be the perfect gift to send in honor of a birthday, to show your love and support, or as a way to express your thanks and gratitude. . Approximately Approximately 17"H x 12"W.